Christmas cactus (Schlumbergera truncata) is native to Brazil, where it can be found growing on trees and among rocks. 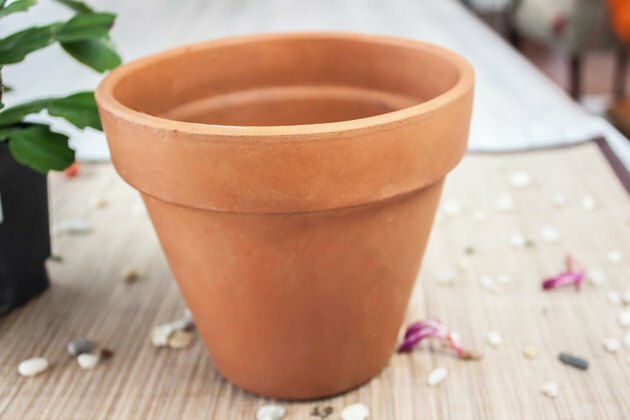 It is most commonly grown in the U.S. as a houseplant, although it can be grown outdoors in U.S. Department of Agriculture plant hardiness zones 10 to 12. These cacti must be transplanted or repotted occasionally to give them fresh soil and room to grow. Repot Christmas cacti every three years right after they finish blooming. They should not be transplanted more often because they grow slowly and prefer to be pot bound. A pot-bound Christmas cactus will be more likely to bloom profusely. If the Christmas cactus does not bloom, transplant it in late winter. Transplant the Christmas cactus into a new container that's 2 inches larger in diameter than the base of the plant. The new container must have drainage holes in the bottom so excess water can drain out. When excess water does not drain freely, the soil stays too wet, which causes root rot. Clay pots are best for Christmas cacti thanks to their porous nature. This allows for better air circulation around the roots, helping prevent root rot. 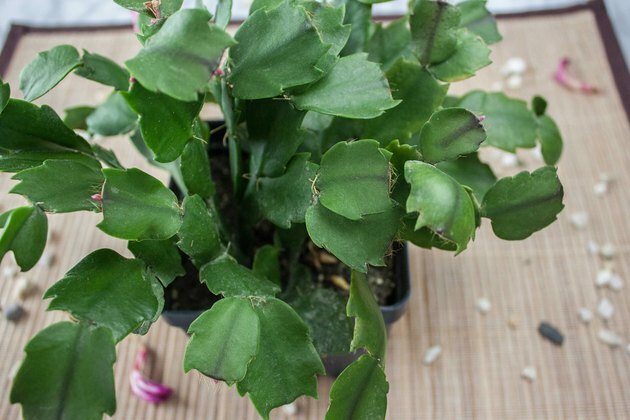 Repot the Christmas cactus using peat-based potting soil that contains perlite and/or coarse sand for fast drainage. 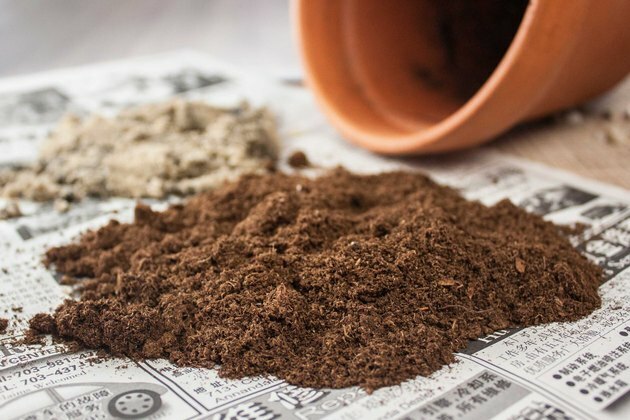 Potting soil that's half sphagnum peat moss, one-quarter soil and one-quarter perlite or coarse sand is ideal for Christmas cacti. 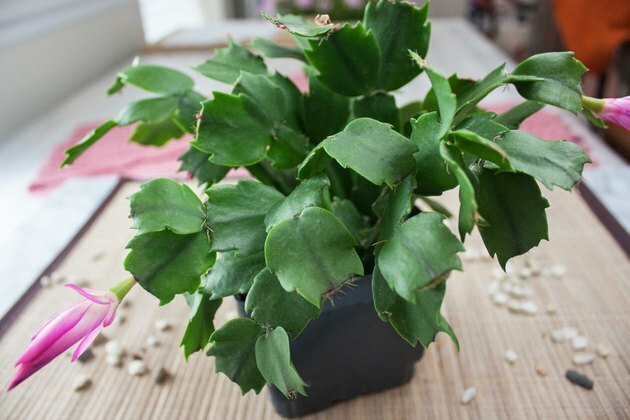 Do not water the Christmas cactus for one to two weeks prior to transplanting. Letting the soil dry out helps prevent root rot. 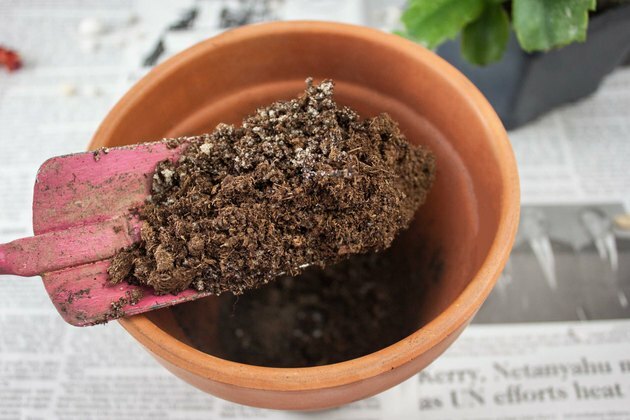 Pour a 1- to 2-inch depth of new potting soil into the bottom of the container. Tip the Christmas cactus on its side; grasp it gently at the base of the plant and slide it out of its old container. If it does not come out easily, tap the edge of the pot gently on a hard surface. Loosen the outer roots gently by hand before putting it in its new container. Set the cactus in the new container; fill in around the roots with new potting soil up to about 1 inch from the top rim of the pot. Do not water Christmas cactus for one week after repotting to give the roots time to recover. Damaged roots cannot absorb water quickly enough and could develop root rot from sitting in the wet soil.